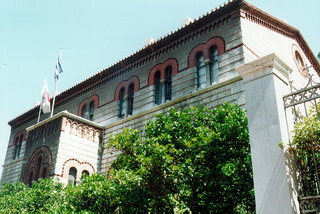 The building housing today the Athens Eye-Clinic is a rare sample of a romantic edifice of a Byzantine style in Greece. The central building consists of the basement and the ground-floor (first phase, 1847-1854) and chamber floor (second phase, 1869). The outpatients’ department is located in the ground-floor (1914-1916). The Eye-Clinic was built by the architect Hans Cristian Hansen and later on, the architect Lyssandros Kaftatzoglou proceeded in some adjustments, like the one in the entrance which used to be covered by an arcade with two columns. In 1869, the architect Gerasimos Metaxas, expanded the northern side to 6,50 meters and added one floor. In 1914-1916, the Sina Street building (outpatients’ department) was constructed by the engineer Aristides Balanos. In 1992, a restoration and conservation study for the Eye-Clinic was approved. By a 1962 ministerial decree, the main and the auxiliary building of Sina Street were identified as a work of art.